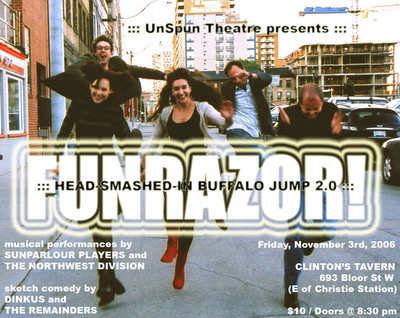 Join the UnSpun Theatre crew this Friday for its fun-filled FUNRAZOR! – a fundraiser for its upcoming production of Head-Smashed-In Buffalo Jump! The sketch comedy of Dinkus and The Remainders; and the music of Sunparlour Players and The Northwest Division! Clapping and stomping! Romance! * Visiting! All funds raised at the FUNRAZOR! go toward the costs of UnSpun's upcoming indie production Head-Smashed-In Buffalo Jump. The award-winning theatre company behind Toronto Fringe Festival hits The Master and Margarita and The Blood of a Coward is accepting submissions from playwrights for its reading series. Plays read in the series will be considered for future development by Praxis Theatre. Interested applicants should submit their work to Laura Nordin.